Requirements & Application of Forklift Licence in Ballarat, Vic - Be Certified Today! The existing national standard obliges operators of forklifts and order pickers to have in possession of a high risk work licence as these occupations are classified as high risk. So if you want to improve your chance of landing a job or advance your skill to obtain a promotion, you have to have an HRW licence. If you are in Ballarat and you are planning to apply for a HRW forklift licence, you can submit your application to WorkSafe. The WorkSafe is the issuing and assessing authority with regard to such occupation. But before that, you have to take an initial forklift training course offered by a Registered Training Organisation (TRO), the list of RTOs where you can take such training is listed below for your reference. Choose What Licence You Need – there are two classes of HRW licence related to forklift operation you can apply for. The TLILIC2001 or the License to Operate a Forklift Truck (Class LF) and this is for operator working on a load-shifting forklift while the other class is the TLILIC 2002 Licence to Operate an Order Picking Forklift Truck (LO) and this for operators who are working on a load-shifting order picker. You have to evaluate which one you need as the licence application requirements and the course curriculum are different from each other. Assess What Skill Level You Have – if you are inexperienced individual and who has no prior knowledge in forklift operation, you can complete the course in two (2) days. On the other hand, if you are experienced and has strong grasp, you can complete the training in just a day. You Have To Register For A Forklift Training Course Offered By An RTO – There are only a few RTOs you can find in Ballarat, those are listed below for your reference. Choose the one nearest you or the one that you prefer to take the training from. Before registering, keep in touch with them and inquire about what you need. Take the training course – depending on the skills you have, the training course usually stretches from 1 day to 2 days. The course is composed of classroom training and practical exercises. After completing the course, the RTO will give you a Statement of Attainment as proof you have completed a forklift training course from them. Be Assessed by a WorkSafe Assessor – as part of the assessment and evaluation process, the assessor/trainer will verify your ability by administering a written test and hands-on evaluation. If you both pass these tests, the assessor will issue a Notice of Assessment which serves as temporary licence. Submit The Requirements to the nearest Australia Post for Processing of HRW licence – submit a copy of your Statement of Attainment, green copy of Notice of Assessment, valid 100 points of identifications, your recent photo (not more than 6 months old) and the duly filled up but unsigned (you will sign it in front of the post officer) High Risk Work application form, along with the corresponding payment. Verification of submitted requirements – the Australia post officer will check the completeness of your application requirements and verify the information you’ve provided. If all is well, they will accept the requirements to submit to WorkSafe for processing. You have to get the receipt issued by the post and retain the pink copy of the Notice of Assessment. Wait for your Photographic Licence to Arrive – it may take up to 5 weeks from the date you submitted your application for your HRW licence to arrive at the address you provided. Thhe HRW forklift licence is valid for 5 years after which you have to renew it. A unique student identifier (USI) – if you’re taking a nationally-recognized training such as in forklift operation, you need to have USI. Simply put a USI as an online registry where all your trainings and studies that you’ve completed can be stored. If you don’t have a USI yet, you can apply here. The USI will be required by the RTO before you can be accepted for the course. You need to have at least 100 points of ID. Notice of Assessment – The WorkSafe assessor/trainerwill issue this document, this is considered as an interim licence until the photographic licence is issued to by the WorkSafe which usually takes 4 to 5 weeks before it arrives at your doorstep. Statement of Attainment – after successful completion of the forklift training course, the RTO will issued you your statement of attainment proving that you’ve completed such course. The HRW Licence application form – the RTO will give this upon completion of the training course. The corresponding application fees for HRW licence are as follows: for new application, the fee is $65 while for renewal is the fee is $49.10. In the renewal process, those licences issued before the year 1995 and the certificates of competency are no longer recognized and cannot be used. If you are a holder of this licence or certificate, you have to renew it to obtain a new one. The process is almost basically the same as the application except that you don’t need to go through the training course. The cost of forklift training will vary depending on the length of the course you want to take. If you are a novice individual without prior knowledge, you have to complete the course in 2 days, it could cost you around $400 to $500, if you’re experienced operator, you can complete the course in just a day and it could cost you $300 to $350 depending on the training provider. An added cost is the application fee of the High Risk Work (HRW) licence which is $65 (as of this writing). If you want to purchase personal protective equipment (PPE) such as steel-toed boots, vest, eye protection and a hard hat, it could set you back an additional $150. Training materials such manuals can be bought from the training provider if they offer such. 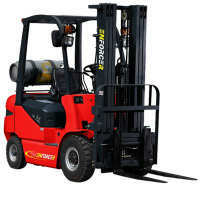 Forklift operator often works in the warehouse, logistic company or in construction site. If you want to be in this occupation and you are asking how much wage you can make doing this job, the average salary of a driver in Ballarat is AU$23.17 an hour. But the salary ranges from AU$19 to AU$27. If you have prior experience and knowledge and can demonstrate additional skills to contribute to the job, you can be offered with higher salary. If you want to elevate your career to have a good chance of landing a job or attain a promotion, you have to lift your skill and credential. You can start by getting a forklift licence in Ballarat. It is great approach of improving your employment opportunities. It is important for you to know first what licence you need to have as there is LO and LF licence you can obtain. Assess yourself to know what is required for the job you want to get into. Having such credential can help you take your career further. It only takes a small amount of time and investment to get such credential but the advantage of having forklift licence can definitely boost your advancement.